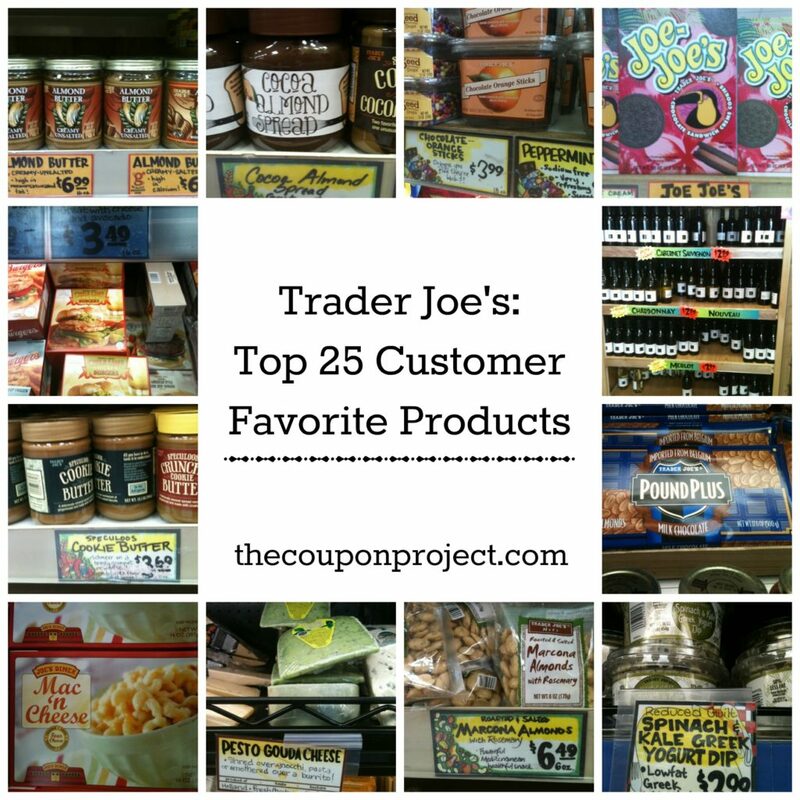 There are a few items I buy at Trader Joe’s regularly that I believe to be a really good deal. 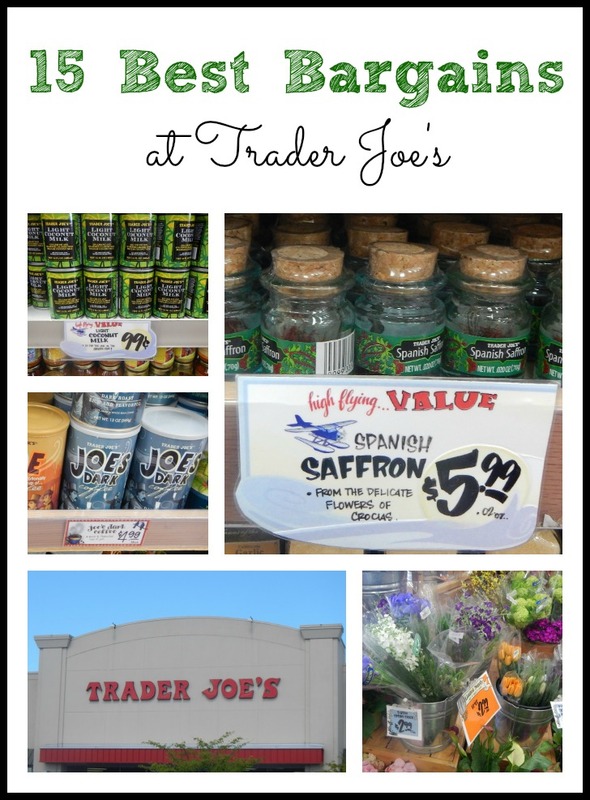 While contemplating this recently, I got a great idea for a post: uncovering the best bargains at Trader Joe’s! As I know how easy it is to gravitate toward the same items, I decided to ask my friends what they thought some of the best values were at Trader Joe’s. Not surprisingly, they mentioned many items I had not considered! Earlier this week, my lovely friend Kellie and I spent some time at Trader Joe’s, noting the prices/size of each of these items and many more. We arrived at a list of nearly 40 items. While many things did seem to be priced well, I decided to dig a bit deeper. Taking my list, I went to three area grocery stores to see could I find a better deal. There were definitely some surprises: some things I thought were good deals turned out to only be just OK, while other things ended up as clear winners. I am only including items you could find at other stores. Sure, the corn & chile salsa and caramel chai are delicious (and often value-based), but I consider these items unique to Trader Joe’s. They aren’t included on my list. I may have compared across brands. Where possible, I worked to keep this comparison apples to apples. So as much as possible, Trader Joe store brands were compared to other store brands. I paid attention to unit prices. I’ve noted ounces and quantities to make sure the comparisons are fair. Prices are subject to change. Trader Joe’s tends to make a price and stick with it. (AKA, they don’t do “sales.”) However, that doesn’t mean that prices may not vary from region to region or change over time. These prices are accurate as of April 2015. I also tried to note regular prices at other stores and pay less attention to sales prices. I also want to make it clear that it’s quite possible you might best these prices in other ways. 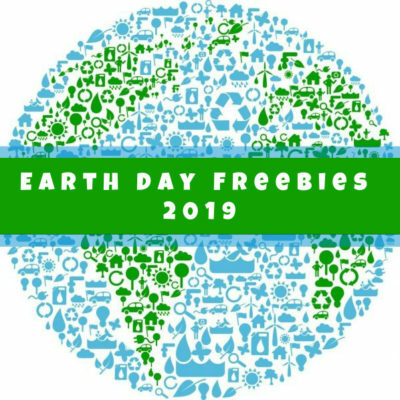 For instance, you might get a better deal by waiting for a sale with a coupon, a loss leader at another grocery store, buying in bulk, or growing your own. For the purposes of this post, I’m just hoping to point you to some really good deals, in the absence of sales, coupons, or other tactics. Thanks to my pal Julie for mentioning this deal to me. Not only is this brand more expensive at other stores, some stores don’t carry it at all. 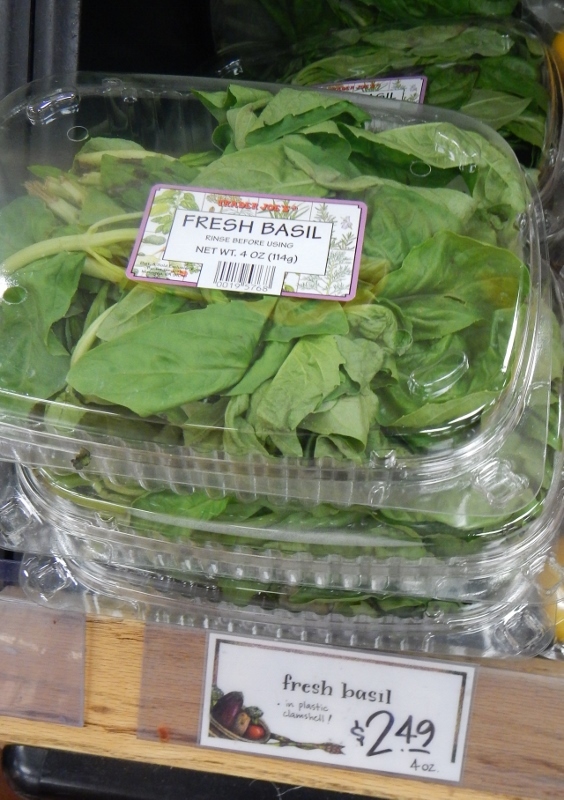 This is a great price for a large container of fresh basil! At two other area stores, I found the same size priced at $3.99 (full disclosure: one was organic). Incidentally, you can also buy a large potted basil plant at Trader Joe’s for $3.49 – much smaller ones were selling for $3.99 at another store I visited. While I was able to find a pound of dates for cheaper at other stores, they were not Medjool dates, which tend to run more money. This is another item that you may struggle finding at other grocery stores, too. 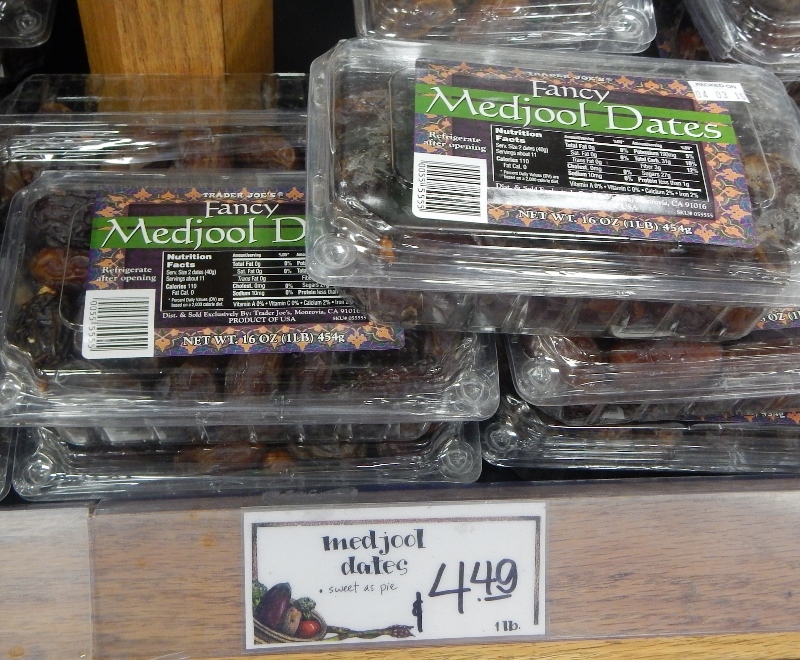 I only found Medjool dates at one of the three comparison grocery stores I visited today. 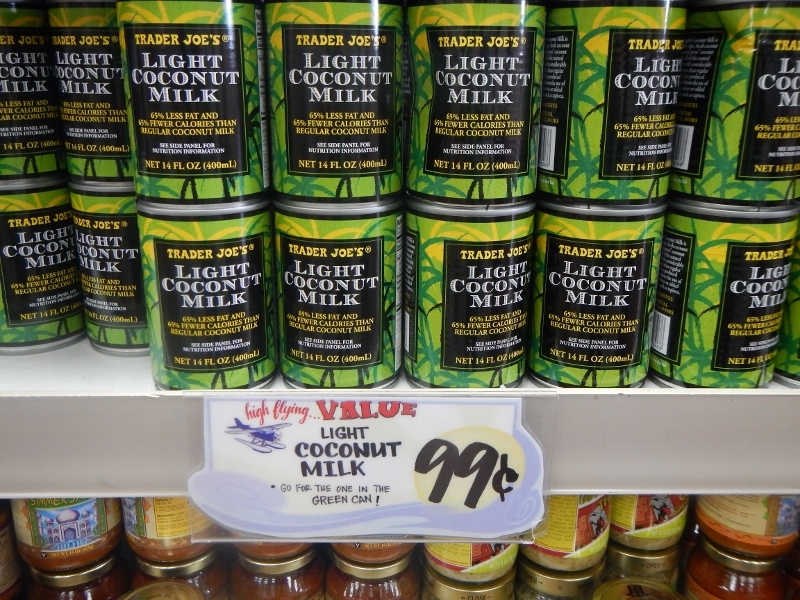 My friends Sarah and Keri both suggested I check out the price on canned coconut milk at Trader Joe’s. At $0.99, this was definitely one of the best bargains I noted in my research! 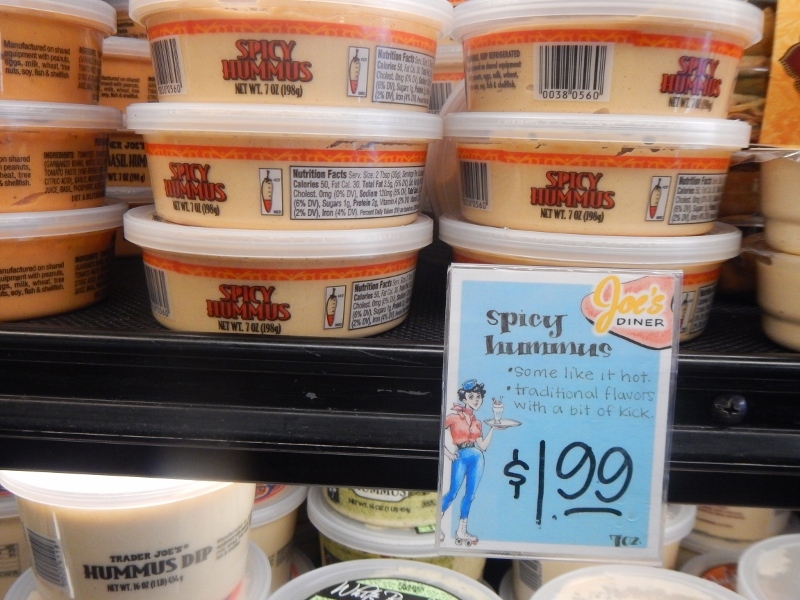 Trader Joe’s offers a variety of different hummus flavors. At $1.99 for a 7-ounce container, I’d definitely include this in the best bargains category. Two other grocery stores I visited were offering the same size of their store-brand for $2.99. 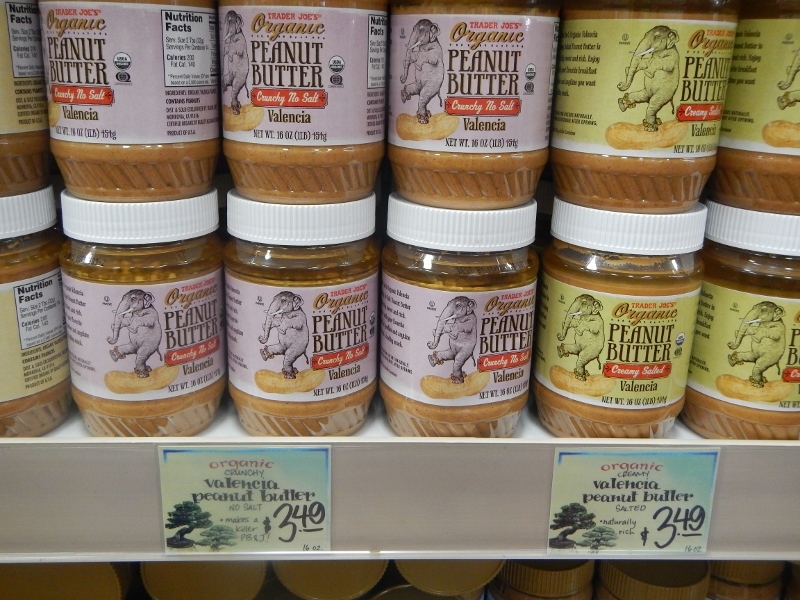 Several of my friends suggested that Trader Joe’s had good deals on nut butters, but after doing some research, the only nut butter I found was a deal was the organic peanut butter at $3.49. The regular peanut butter was priced at $2.49 and I was able to find lower prices than that at all three grocery stores I visited today. 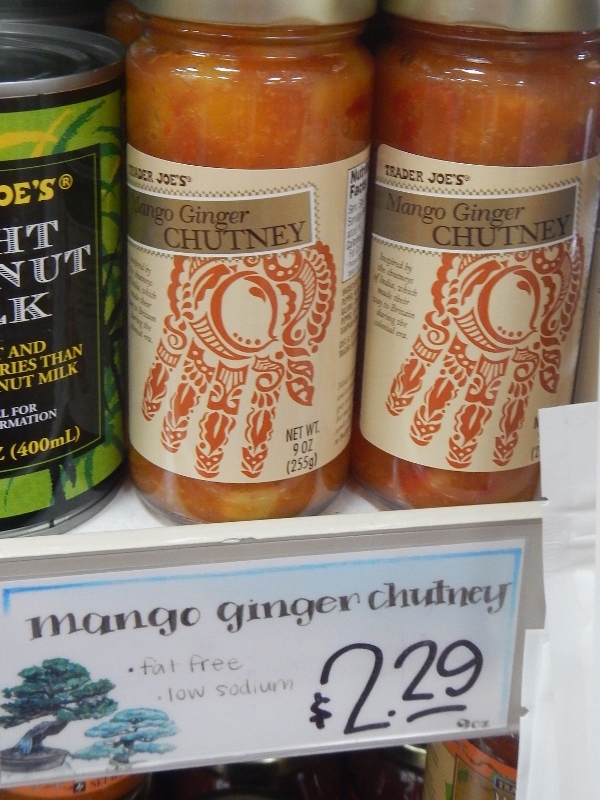 Trader Joe’s Mango Ginger Chutney is easily one of the best bargains in the store! This specialty condiment is delicious when served on chicken or mixed in rice. It can also be expensive at other stores! Two stores I visited today were selling another brand in the same size for over $5 a bottle. 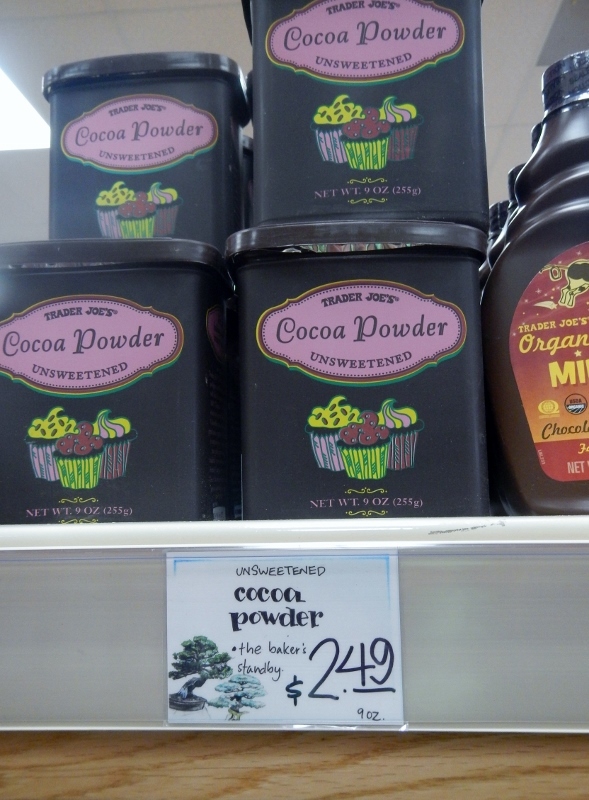 My friend Tom mentioned that the cocoa powder was a good bargain. Turns out, he’s right! 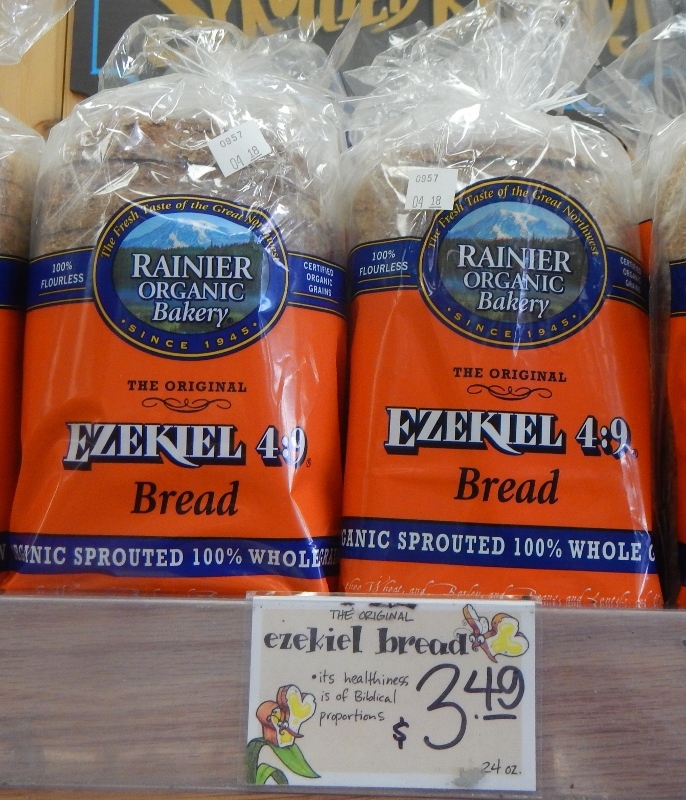 At two grocery stores I visited, a near-similar size was selling for over $4. 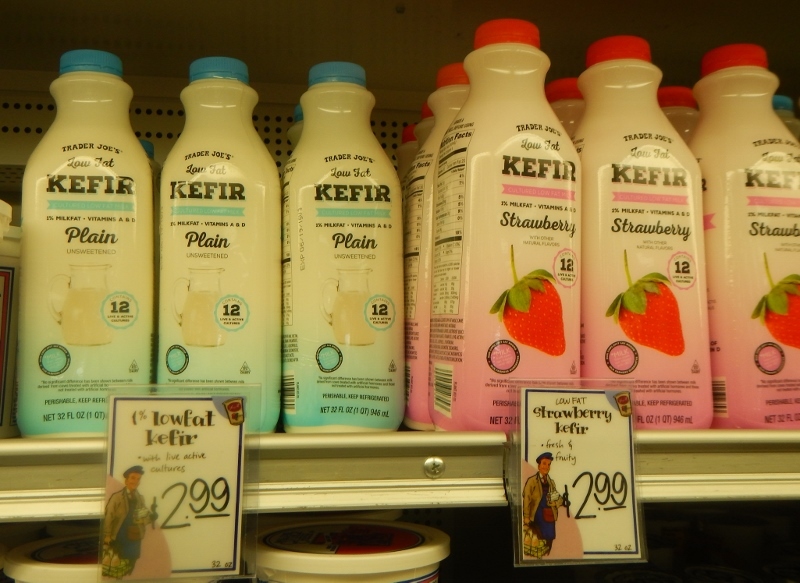 One grocery store had a 10-oz container for $2.69. Even so, I feel the Trader Joe’s version is definitely worth mentioning. Now, I don’t buy saffron (maybe due to the crazy high cost? ), so I can’t speak to the quality of the Trader Joe’s brand. However, if I needed it – I’d spring for the Trader Joe’s version at $5.99! I was only able to locate this item at one of the three other grocery stores I visited today! I am pretty sure I’ve seen it selling for as much as $4 elsewhere, and I’ve certainly never found it cheaper than Trader Joe’s. If you’ve never purchased this item before, consider it! You can slice it and use it as a starch under marinara or chili. Very good – plus, it’s gluten-free (if that’s a concern for you). 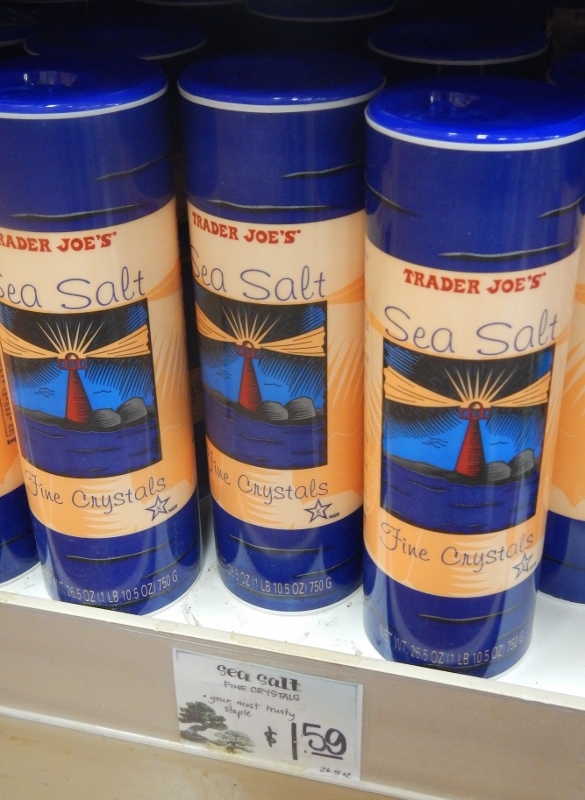 Here’s another item I wouldn’t have thought to have checked – sea salt! Thanks to my pal Erica for the great tip. A 26.5 oz container is $1.59 at Trader Joe’s. Other versions when compared ounce-for-ounce were considerably more money. 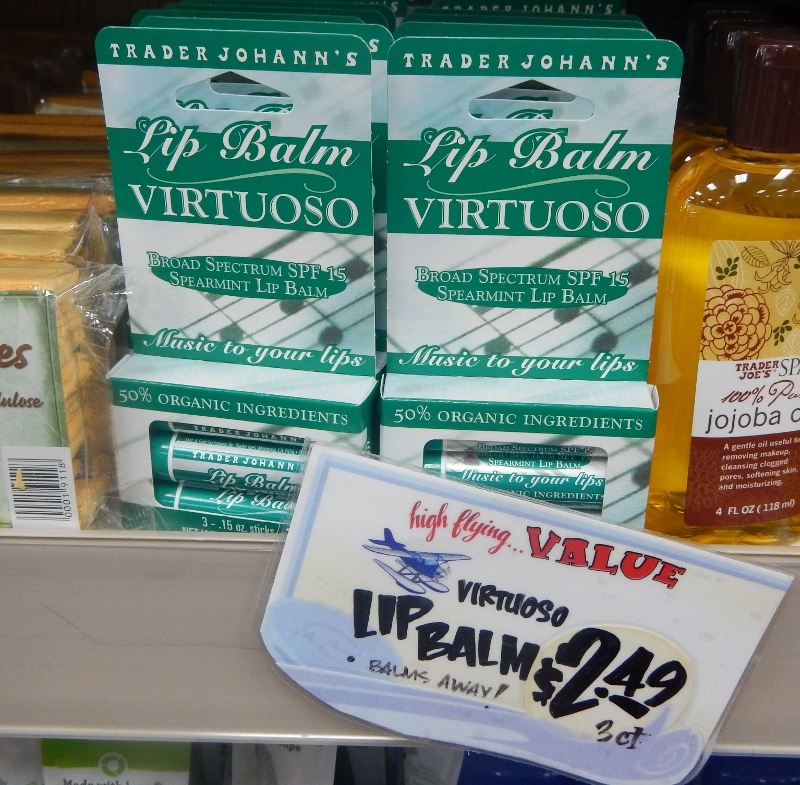 My friend Heather suggested I check out the 3-pack of lip balm. Another item I’ve never noticed at my Trader Joe’s! Turns out it’s a great value at just $0.83 each. I could not find a better deal than that today. While I was able to find this same price at one other store, the other two stores had this same item priced at least a dollar more. Given that, I feel it’s worth mentioning. 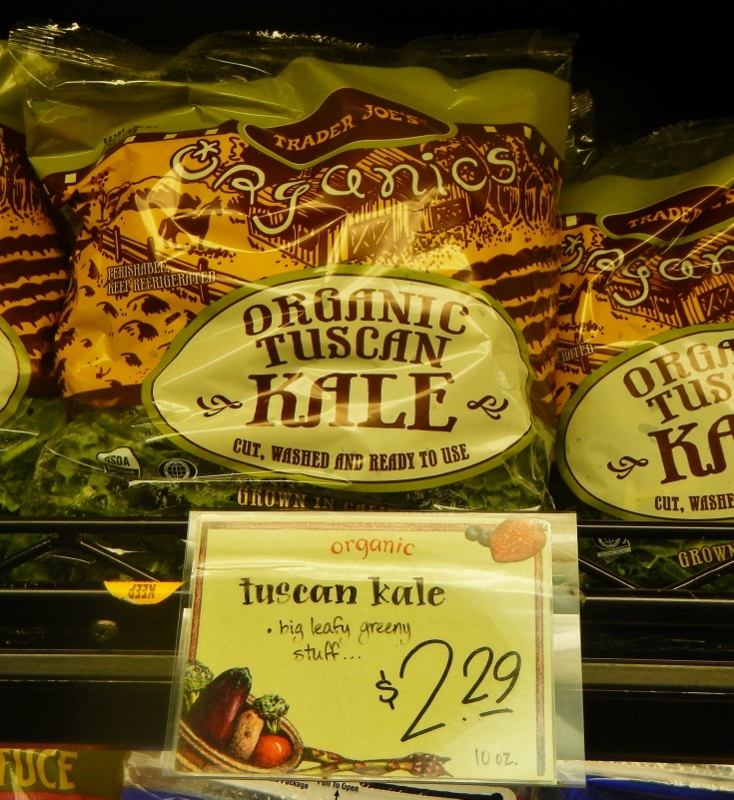 My friend Tiffany suggested the Organic Kale is a good deal. At first, to be honest, I was a bit skeptical. Those are just small bags, right? Well those “small bags” contain 10 oz. At all three of the stores I visited today, the small clamshells of organic kale only contained 5 ounces and were all closer to the $3+ mark. Turns out this actually is a fantastic deal! 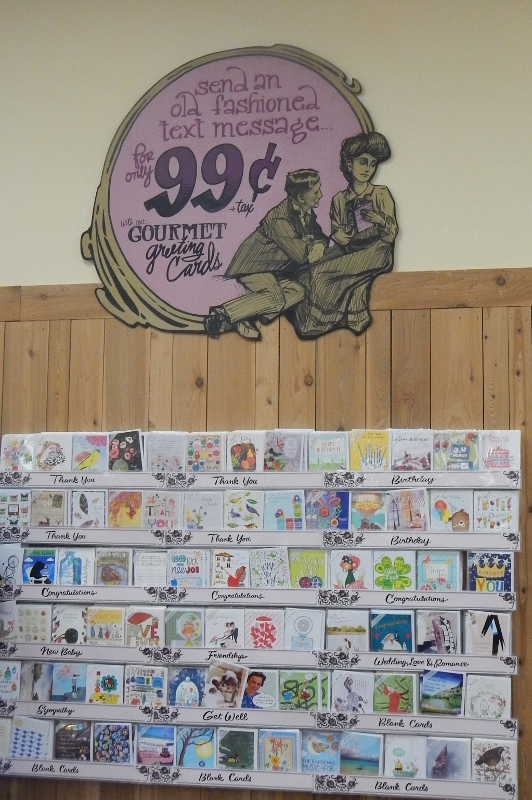 My friend Devon mentioned she likes buying greeting cards at Trader Joe’s. How have I never paid attention to this display? And yes, they are all $0.99! While you can definitely find $0.99 at other stores, I think you’d be hard pressed to find a selection as cute as this! It’s definitely a top bargain in my book. As a final note, I’d like to offer a HUGE thank you to all my wonderful friends who helped with this list! In particular: Heather, Anika, Devon, Tom, Susan, Keri, Tiffany, Erica, Amber, Lynn, Mandy, Tara, Misty, Meg, Marie, and Julie. Phew! I think I got all of you! And an extra special shout out to my girl Kellie who made time out of her busy day to meet me at Trader Joe’s and scout the deals with me. You guys are the best! I bought the Orange Muscat Champagne vinegar a day or so after you posted it (a week or two ago?) and I’ve been using it in water along with apple cider vinegar and some sweet leaf apricot stevia drops. It is DELISH. I agree – that vinegar is amazing! So far, I’ve only used it in salads, but I hope to try it in some of the recipes that are listed on the side of the bottle, too. Thank you so much for taking the time to do this. I love, love, love TJ but the closest one is 100 miles. I added this list to my reading list in my iPad mini! Now I can refer to it when I’m at TJ. I hope you can get one closer to you! 100 miles is a loooonnngg ways! Wow! This is a great list! I live in Spokane WA and just found that Trader Joe’s organic sour cream is only $2.12 compared to what I had been buying it for at $4.69! 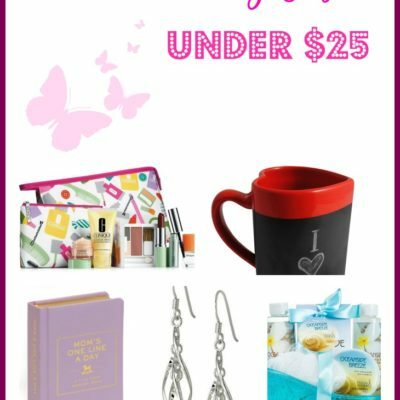 Thanks for the great list of other bargains!! Agree with your friend on the wine! TJs sells some really good wine under its own label, particularly some of their Côtes du Rhône red wines. For about $5-$6 a bottle, there is really no reason to buy the Charles Shaw. To me, these wines are TJ’s best kept secret. I appreciate you sharing your tips. I will definitely look for those the next time I’m there. Thank you! Thank you for sharing your tip – perhaps it will help another reader! Thank you sooooooooo much for all the hard work you put into this post! My pleasure! Plus, it was a lot of fun to do! Large Brown eggs (I think they’re $3.49). Bread- honey wheat (basic loaf) that usually goes for $1.99- most other stores has tons of other ingredients- this one is basic, w/ a low-price too! The eggs and bread- is one of my usual purchases at TJ! I’ve personally had issues with the bread molding quickly when purchased at TJs = perhaps this is related to the fewer ingredients? Either way, I have found when I buy bread there I need to refrigerate it if I hope to have it last more than a couple days. Thoughts? Yes! I think it’s a great sign! Bread in Europe doesn’t even last 24 hrs on the counter (same low ingredients and their wheat isn’t hybridized). Great post! I also buy the TJ’s powdered chai tea mix for a bargain–It’s $3 or $4 for a 10 ounce container which is much cheaper than the other main brand on the market (which I can usually only find online or at specialty stores anyway). Let me teach you a valuable secret. Go out of your way, maybe even out of your comfort zone, for spices. Most importantly, saffron. The Indian store near me sells 1gm for $6, 5gm for $20. 1gm is about 0.04 oz. 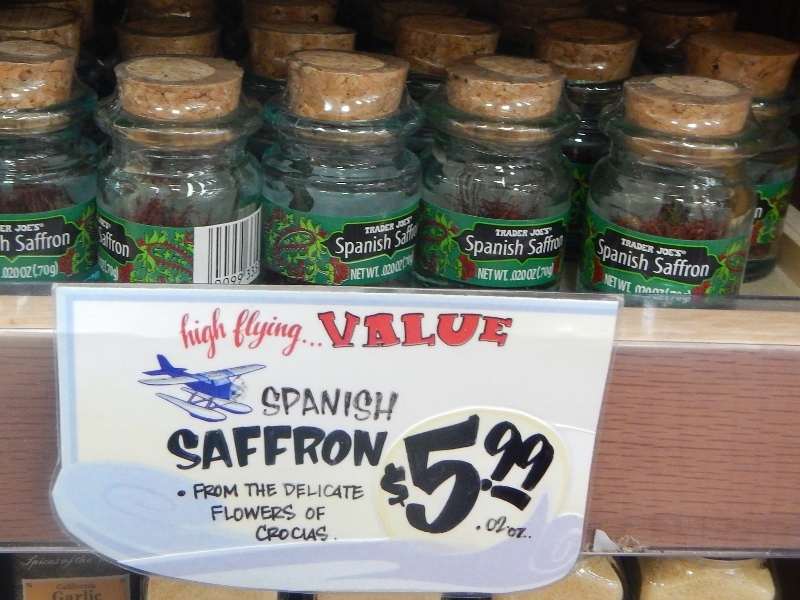 Their spices are usually fresher , more plentiful and definitely less expensive. I’ve also written a number of times on the value of shopping Asian markets, in particular. 🙂 I completely agree with you here. Thanks for the tip on the saffron, specifically – as that is a particular spice I’ve not purchased. The White Cheddar Corn Puffs taste just like Pirate Booty, and are $1.99 for a large bag vs around $4 for a smaller bag of pirate booty. We also tend to buy our organic apples, pears, and bagged greens and coffee from there due to the low cost. And in the freezer section they have grass fed ground beef sold in one pound packs for $5.99. It’s always $1 more at whole foods, unless on sale. Nice tips = appreciate your feedback & price points! My best advice for shopping trader joes, talk to the employees! They hire some great people and if you want to know the best values (especially on wine) ask to talk to the section or store manager. Wonderful tip – thank you so much for sharing! Their prices on Luna Bars and Cliff Bars are often better than the grocery stores, unless you can get a sale/coupon. We also love their dog biscuits (the big boxes) plus the Charlie Bears liver training treats. My dogs love the chicken jerky, which is not a great price, but they are US made, which is difficult to find, and then they are cheaper. I appreciate this – I’m going to check out those bars the next time I’m in. Yes! I’ve has employees INSIST we open up something to try it. They really do hire the best people! the peanut butter is a better deal than that. I do not think you can find a PB with those ingredients for cheaper at a store. Agreed. 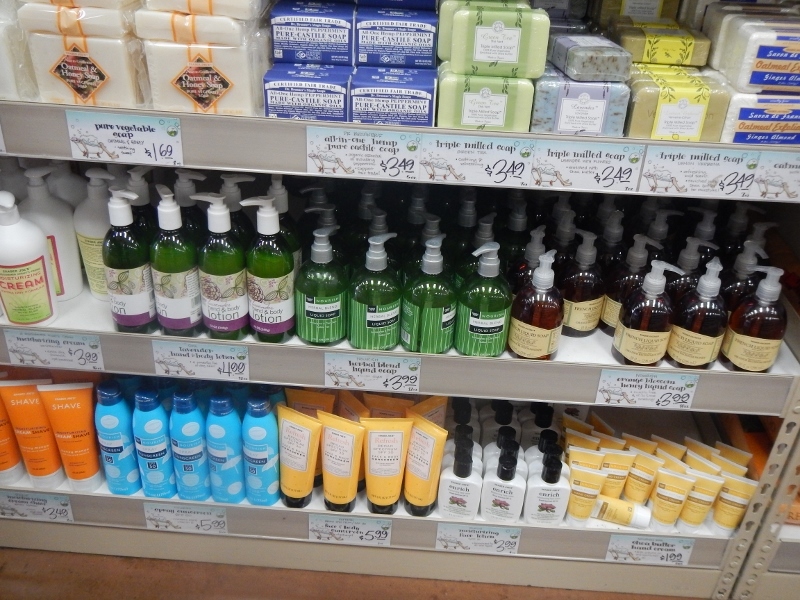 Their focus on few and natural ingredients is another reason I shop there! The regular peanut butter? Hmmm. I will double check the ingredient list the next time I’m in. Thanks for giving me pause to look again! Trader Joes has at times carried Vanilla beans at an ingrediblie price, I want to say $1.99 or something like that. Grocery stores are usually 8.99 (sale price) up to about 18.99 for beans. The only other place I’ve seen them for cheap was Cost Plus Imports. But, I haven’t seen them at Joes for quite some time. The “pop tarts” use to be a really good price too. Thanks for doing this, I’ve felt like TJs does a great job at pricing their groceries and always shop there first, then I go to the chain to get stuff that TJ’s doesn’t sell. Thanks for your additional suggestions! Good luck finding “cheap” vanilla beans for a while…. my go to place that had them in bulk for around $35/lb is now up to $149/lb. After I investigated this, seems the crops have been horrible due to several factors making prices skyrocket. Sigh…. My favorite is the 10 count instant coffee sticks for $1.99!!! They have cream and sugar already added so it’s super convenient for on the go! I also like their packaged pizza dough for $1.19. Super yummy and easy! And baking soda at $0.99 is awesome too! 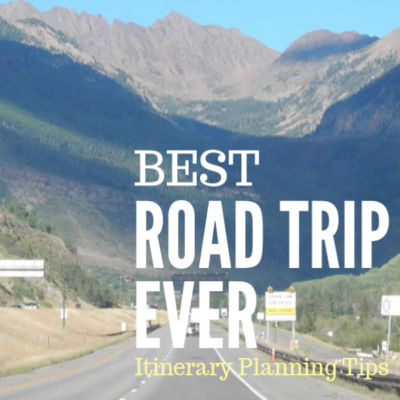 THANKS for this list and some new ideas to be on the lookout for! It always amazes me how many new things there are to find at TJ’S!!!! 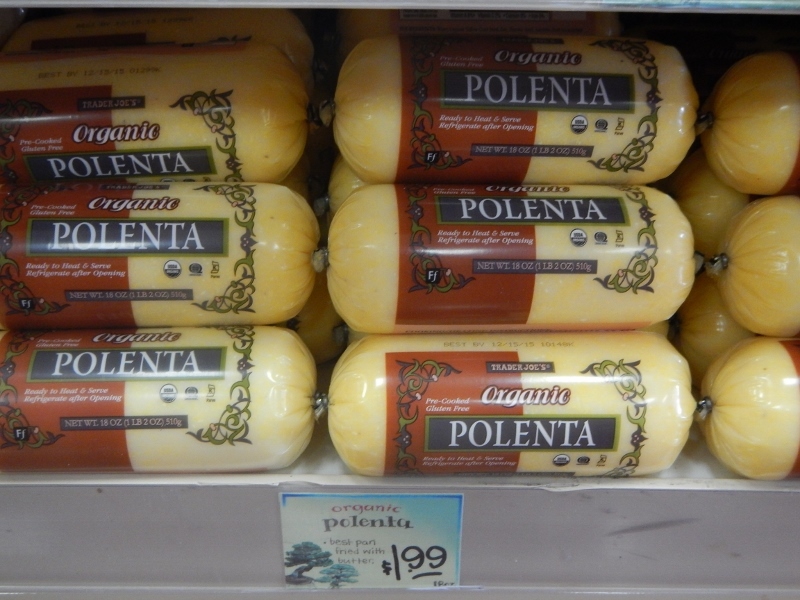 I love the frozen polenta with spinch and carrots, it goes great with pork chops. The frozen Asian section rocks- spicy beef and broccoli, orange chicken, shrimp fried rice are all awesome. I love tj’s so much!!! One of my favorite items is the bacon bits and pieces. It is uncured and delicious ! At $3.49 it is a steal because you can always count on that price. I never know how much bacon will be at the regular grocery store and it is usually cured with sugar. Thank you for this article. I see lots of good stuff to try. Frozen Brussels Sprouts only $.99 a bag-considerably cheaper thsn other stores! I’ve bought Sunflower Seed butter there for years because at Fred Meyer it’s way more expensive. My daughter has a nut allergy and this stuff is a lifesaver. Riced cauliflower (although probably not a huge deal). It’s so convenient if you need rice in a recipe but don’t want the carbs. Frozen rasbperries – while not as cheap as buying a big bag of berries at Costco, frozen berries, regular or organic are crazy expensive at other stores. Great in kids lunches. Their cheese and meats for a charcuterie platter are great deals, and you can find a pretty nice selection. I like the frozen butternut squash chunks to make soup . Yummy. Also the frozen Berry Blend & the Chipotle Black Bean Burgers are really good & at a good price! I agree that the premade pizza dough (several varieties to choose from) are a steal @$1.99 each. They come packaged in clear plastic bags in the refrigerator section, and freeze, thaw, roll, and bake nicely! 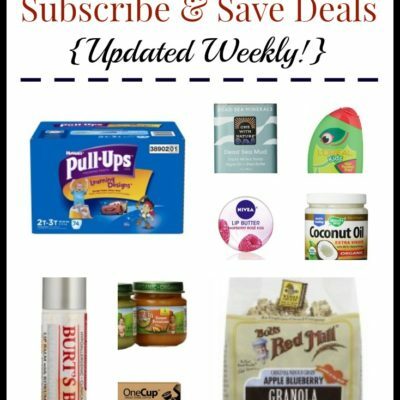 Now go stock up and save$$$$! Love anchovies in my Caesar Salad dressingI, I always stock up at TJ’s!